Replies: 37 (Who? ), Viewed: 2302 times. When you make a new custom 'hood, do you plan everything first (build all the lots and create all the sims you will want it to have before start playing) or do you let it develop naturally (build/create only the essential to start playing and do the rest as you go)? If the former, how do you menage to not go crazy with the urge to play the game when all the world building becomes tiresome? All my hoods are planned. The latest one, Newcastle, took about 3 days to set up-because I like to start with one pixel per house,(the houses are premade by me), and set it up so that I go in order. Whatever mistakes I made in the house I correct at the time of playing, and by the end of the first rotation I have a pretty good idea of what will work and what doesn't. I start with a 'what if' premise and work from there. This town has 24 singles who may or may not end up together, depending on their sexual orientation. It's been entertaining so far, but it does take time to get through the entire neighborhood. As for other buildings, I have a set of buildings that serve the common purpose and they rarely change. They consist of a town hall, a park of sorts, and perhaps a tavern (Newcastle is set in the medieval period), so the pixels can get jobs, meet each other and play games. When I do start a new 'hood, which isn't often, I start with one or two households, build as little as I need to get them started, and start playing. Building and building without seeing Sims using the lots, would drive me nuts. But then I make no bones about it -- I'm a player not a builder! As often as not they live in Maxis bin houses, given a quick makeover so they don't look straight out of the box. I started Teston Woods with a single Sim living in a little cottage by a remote roadside set in the midst of the vast empty Arbordale terrain. I then let the game generate its full complement of townies so he'd have someone to talk to. I started New Desconia with two single Sims and three CAS-made townies. I gave them 2 community lots (a shop and a park) to visit and started playing. These 'hoods were "planned" to the extent that I had some idea where I wanted them to go, but I'm far too impatient to build everything before I start to play. Anyway I think communities that grow organically are more interesting than ones planned by the Central Committee. No, I use accidents in the game and whatever whim strikes me to create stories that create hoods. I never get bored with it because I just follow whatever idea I have at the time. Sometimes I have one that takes a really long time to fulfill, but the sims will wait for me. They're good that way. #5 26th Feb 2019 at 3:11 AM Last edited by cord11 : 26th Feb 2019 at 3:44 AM. Nth edition (3rd, probably) of Rematra Village and its subhoods. Only things really planned at the start are its name, certain sim families and certain lots. Almost everything else was unplanned. Then I decided to move things around and organize the hoods. Now Rematra Village is a farming village (mostly), Dryis Harbour is a harbour bordering desert shopping centre, Falaun Valley is a downtown commercial plateau with an ironic name. Tamaziki towers is named and designed after and around the two prominent towers that reside in the vacation destination. Crua Coasts is the vacation getaway/castaway/pirate island archipelago. Started out planned, turned into and still is a massive mess (yay) one day will be planned again. #7 26th Feb 2019 at 5:34 AM Last edited by HobbesED : 26th Feb 2019 at 5:46 AM. I've done both - thrown a few Sim families together and played, only adding more neighbors as the need required, and playing the families as long as I wanted just enjoying their growing up without rotating to other families. It may have led to teen townie Meadow Thayer being the first kiss for multiple generations of the family but it didn't bother me. My latest hood - Shape Island - was totally planned at the start. I created 50 single adult Sims of non-Maxis bodyshapes in CAS using 6 different male shapes and 10 different female shapes. This setup took me more than a week as I created/used 42 different skinsets with varying M/F shapes and shades for those 50 Sims. (I also created a personal MultiPollinationTechnician mod with 4 more combinations and two different colors for possible abductions.) I placed 50 unfurnished houses with identical floorplans down and moved one Sim into each house. I then played each house one season (5 Sim days) to get going - furnishing the houses, finding jobs, meeting the neighbors etc. Pairings require 3-bolt relationships (no ACR). No planning after that.... Since then I've been rotating through the hood playing each family one season at a time watching how they interact and grow while keeping interactions with Maxis Sims to an absolute minimum. Shape Island has now completed 90 Sim days and has 186 living Sims with fourth generation babies being born as the second generation has begun dying off. Building the Sims and making the skins did take a lot of time and effort, and yes, it was boring at times. But my goal was to make this neighborhood of all non-Maxis playable Sims. So that kept me going. And the first round of play was still boring, basically going through the same sort of things 50 times, deciding what furniture they could afford and how to arrange it, what color to paint their houses, what jobs they might want and hoping to find them... It was tedious. But it's been very rewarding since then. You can always play a different neighborhood in between bouts of building and planning. If you're going crazy wanting to play, play. If you're building a hood to share it's important to get everything done in a certain order; but there's no law against making a copy of the hood and playtesting it. Since you're making backups at every stage of construction, you can do whatever you want with the copies. Just bear in mind that this may take some of the creative pressure off. Nothing keeps you going through the "saggy middle" of a project like wanting to get to the fun part at the end and realizing that the only way out is through. At the same time, nothing kills your fun like the feeling that you can't do what you want to do till everything is perfect. If a neighborhood is perfect, there's no incentive to play it, and in the course of creation and play, you'll keep running across Better Ideas, anyway. So start off recognizing that a hood is an ongoing, open-ended project. Decide what the core concept of your vision is, create the sims and lots necessary to experience that core, plop them down, and start. Even if the core idea is "a busy city with no blank space in the map," there's such a thing as hood deco to make the place look like it's been there forever and every bit of it is built-up till you get around to actually playing it. You can also download lots (Zarathustra's can be good for this) that fill up the map, and if you don't want to (or your computer can't handle) actually play them, bulldoze them later when you're ready to use that space. Remember, even the smallest, most stagnant towns undergo changes in their makeup over time. Ask anybody who was ever raised in a one-horse town and moved elsewhere. Every time they visit the place they, and the people who live there, think of as the stable core of the universe, they'll notice something different. "What happened to the Conoco station?" "Conoco decided it wasn't cost effective and pulled out so now it's an antique store." "Wait, where's the Old Jones Place?" "Termites, dry rot, you name it, plus the highway was too close. They've built a new house on the other side of the ridge." "NOOOOOO! What jackass built a McMansion on the Boy Scout Field?" "You know the Boy Scouts never actually owned that field, right?" In most towns and cities such changes are a part of the texture of daily life. Some building or area is constantly being built up, torn down, repurposed, uglified, gentrified, paved over, greened up, expanded, contracted, rezoned, renovated, updated, or moved. People and institutions are born and die, move in and move out, move on up or hit the skids, every day of the week, and this necessitates changes in the environment. Assume that your neighborhood will be similarly dynamic and build in some flexibility, so when the Better Idea or the unplanned twins come along, you'll be ready. Although I don't really plan, I do like to make my hood layout make sense with some sort of story as it evolves. My three in-play hoods are also actually all part of the same story, so they tend to overlap with some of the same lots (franchises) and even some of the same sims, but different aspects that make them all quite different, to me, anyway. In all of them, though, I tend to make it look walkable with very tiny lots, often buildings are no more than 6 or 8 square on a 1x1, or a little bigger on 1x2, and lots are moved quite close together. I like seeing the rest of the hood in lot view so it feels connected. I rename the streets to fit the story and history and use addresses that make sense. I give them all elaborate descriptions. Recently, I created a story where part of the hood had been a large estate, but was now broken up, so all those lots in the estate area would have a certain hood-visible tree here and there planted by the estate owner in the past, and that led to using those trees as 3Dmodels for the mod that generates a ghost of that owner, who is now capable of haunting all over town. Great fun, because I never know where she'll turn up and I forget till she does. I "zone" areas into commercial, residential, rural, etc. I use filler lots sometimes and give them names to fit what I want because I tend to hang out in hood view admiring it. And I always just go with random ideas. Recently, I had the idea to make a residential lot a community one just so I could name it something for hood view, but, then, I realized anyone could go there and so it's kinda like an abandoned house now that squatters might use, new play idea and new story direction. Often something evolves just because I'd like to try a mod or an effect. I'm struggling a little now, because I've started building a new style of house that I really like, but not sure which hood it really fits... we'll see. So definitely I want to build a longer list of necessities up front that can be owned and purchased (and rented) by sims. Sim-wise, I've mentioned in a few threads that I never really make my own sims in CAS. I will however, make a handful of random adults for a new custom hood. Maybe 3-5. Then I let them mix with the maxis townies and my own, and it usually grows pretty quickly from there. I experimented with starting with a Uni, but I still found that I needed far more buildings than I actually had, and I'm not sure I'd start that way again. Either way, more building! Some of mine are meticulously planned....and sometimes I just want to play, so I plop down a few houses and community lots from my (frighteningly massive, something like 600 lots if I've got the whole thing in the game) lot catalog and generate a few families in CAS and just play. Generally, I have neighborhoods in all states of development, and I play/build them according to my mood when I have time to poke at the game. If I'm in a building mood, I work on one of the hoods that needs that. If I just want to play, then I play one of the ones that are good for that. Most of them have detailed rigid rule sets according to the way I want to play the neighborhood, some of them I document with pictures on Tumblr, but one is just "freeplay" that I don't document, which I can play when I don't want to deal with rules (which I usually like, but even I need a break sometimes ) and don't want to feel obligated to take pictures. The key, for me, is to have lots of different things to be able to do within the game at any given time, so that I don't, for instance, get stuck with needing to build when I'm not in a building mood. I can play a different neighborhood that doesn't currently need any building until the desire to build strikes again. I'm a player not a builder! Same here. I'll create the terrain for my Fire Emblem world, get some hairstyles, make the townies, and follow the canon for a generation, but from there, I'll let the Sims 2 engine guide the story. I'm a player, an impatient player lol. I don't build hoods from scratch I find ones that I like and download them, sims free. Small with some basic decent structures in place, maybe a bit of deco. Coral Bay is about 3 years old now. Before that, I did build a custom hood from a just a map and downloaded houses but that got way too big and didn't look very good, so I tossed it. I will also occasionally make a hood just to play a challenge, but that is not really 'a neighbourhood' it might just be the challenge house and a few community lots. I started Coral bay with 12 sims and grew it slowly, it's maybe halfway 'finished' So if I feel like it I might twiddle with hood deco, or decorate a house or add a building, but I do it in small doses so most of the time I play my families. Yesterday I redid my public pool to try out Rosebine's pool edges (worth checking out http://modthesims.info/d/623949/non...pool-edges.html ) and ended up changing quite a few things there. I was thinking today I might try adding some trees in this one bare spot on the mountain that I noticed while decorating the pool. I only tend to build an entire building if I can't find it already made for download or two if I feel like building. Most times I tweak or decorate something by someone else. Again it's because I'm impatient to get on and play. Mostly planned. I don't build everything, because I want some of it to develop naturally based on the needs of my hood, but I tend to lay out empty residential and community lots in my main hood, or at least have a vague idea. And sometimes the plan changes, and I need to bulldoze and rebuild. Seems realistic. I do build houses prior to sims moving in because I don't want to waste their household funds fussing around with it. I started my first custom hood, back in 2005, when The Sims 2 came out, with a single family. It was a vanilla hood and I did not know about mods and things back then. As the bin sims came along, I added them, and over time I must have added at least 20 other families. I built houses for them as needed, and once in a while, I built a new community lot. The hood blew up in around 2010 with more than 224 families and I went into mourning for a while. I did, however, kept all my lots - I still have my very first boring box house So I guess I can slap down all my lots on a map and have a complete hood ready. But - I like the growing, growing, growing part - and no real town is completely done before anyone moves in, anyway. I started other hoods with 12 to 24 single sims, all star signs and aspirations represented. That worked too. Just the necessary houses and a couple of community lots - and then grow from there. Mine are always built from scratch taking inspiration from real locations and/or from other lots and 'hoods. They're usually divided into districts. A district for fancy Sims, one for mid wealth and one for the poor scrubs. The 'hood's main amenities are located in the mid wealth portion, unless the type of lot calls for it otherwise. The Sims in the 'hood typically are not planned and don't appear until after I've at least 10 lots. Even then, it isn't often I'll play until it's fully developed. I don't often have an urge to play while building, and this works as I often make several renditions of a 'hood. I've got 5 copies of one of them, all from different times of development. Sometimes one has a need to remove a road or make the body of water bigger, and I can't have the little leeches in the way of that. I'm the type of god that would plan and build, then change my mind half-way through and whoops there goes the dinosaurs. Or would that be Simosaurs? I'm building my very first custom hood right now while I'm playing an apocalypse challenge - so unplanned. I hope to have a nicely decorated hood that's fun to play when I'm done but I'm not sure I'll be able to pull the whole map together. I like building the hood as I'm playing though - that's been great fun. If I were to ever build another hood after this I'd definitely do some planning before I start though. With Calamity Hills I just picked a hilly map because I thought the tiers might be interesting for the challenge but in reality they're a PITA because of the camera movement, my roads are janky and I have huge swaths of green terrain everywhere from lot view I'm trying to dress. Still some areas are coming together really nicely (I think) and I love a challenge so this was probably a good start for me. And having never built a neighborhood before - even if I wanted to - I don't think I could have planned for these things. I imagine the planning comes with experience. At the same time, nothing kills your fun like the feeling that you can't do what you want to do till everything is perfect. If a neighborhood is perfect, there's no incentive to play it, and in the course of creation and play, you'll keep running across Better Ideas, anyway. So start off recognizing that a hood is an ongoing, open-ended project. Decide what the core concept of your vision is, create the sims and lots necessary to experience that core, plop them down, and start. This definitely tends to be my biggest stumbling block. At this point, I've done both planned and unplanned hoods, but there's always this thought in the back of my head that they're just temporary while I figure out my 'perfect' hood. Of course, I've yet to do that! As you say, I'm always coming across some new mod or bit of CC or an idea that sounds interesting. The sad thing is that I don't think I even really know what I want from my 'perfect' hood I also need to keep in mind your next point, that is okay (really!) to bulldoze and rearrange lots as time passes or if something just isn't working. #19 28th Feb 2019 at 8:20 PM Last edited by gazania : 1st Mar 2019 at 4:57 AM. Main hoods have a very loose organization. There is a shopping area, a wealthier district and a not-as-wealthy district. There is also a more-remote area for people who prefer more-open spaces. A few community lots are located outside the main shopping area. I don't have a Downtown. Shopping districts are similar to main hoods, except there is a small artists' section in the shopping area. Now my custom Uni in my custom hood ... there is a stricter form of organization. There is an area for classrooms, quick coffee and cafe spots, school clubs, etc. Buildings are both modern and according to my history of the Uni, converted from old residences on the property. Dorms are farther out. 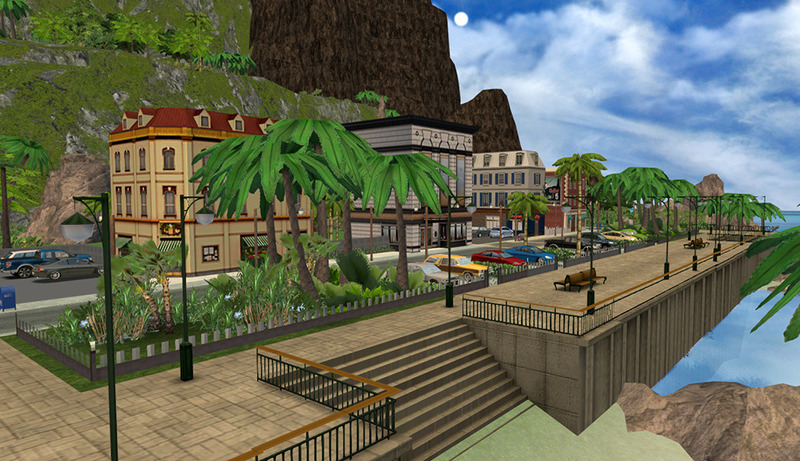 Then there is a seedier "downtown" area outside of the campus layout, as well as a nicer area. I made most of the buildings. I have made two custom vacation hoods, and while I still have the Maxis ones (yes, I have five vacation hoods), I play those two pretty exclusively when my Sims want to get away. One is based on a historic hood, with lots of old buildings to tour, though I make sure to put in different things for my Sims to do. That is a mountain hood, according to Maxis. I based the buildings on similar places I've visited in the U.S.; mostly in the East. (Think New England and the Mid-Atlantic.) The other, while technically a tropical area according to Maxis, is actually more of a general beach destination based on coastal towns I've visited in the U.S. Think of .... well ... beach towns in warmer areas. More emphasis on bars, restaurants, parks, shopping, though my lighthouse from a previous contest is in there, too, since beach towns often have a great history, too! For the historic hood, I researched houses built in the U.S. between 1700 and 1750, carefully studying floor plans if possible, so yes ... that was pretty planned! For the beach hood, I researched the lighthouse, basing it on a Mexican lighthouse, but most buildings are built from my memories and a good Googling. Not so much care about floor plans or historical accuracy with those. The Uni and the vacation hoods took at least a month each just to create fresh lots and plan the layout in a test hood (before even having a single Sim set foot in a lot), and the Uni still continues to expand from time to time, according to my whims or busts of inspiration. I have no qualms about using downloaded lots, and there are many of them in most of my hoods but most of the time, I have a certain type of building in mind, and maybe it's because I'm too nitpicky (! ), but I make the building myself. You can also download lots (Zarathustra's can be good for this) that fill up the map, and if you don't want to (or your computer can't handle) actually play them, bulldoze them later when you're ready to use that space. Really Peni? Bulldoze Zarathustra's lots? I think you will find that they all enjoy rigorous legal protection as Buildings of Outstanding Architectural Merit. [QUOTE=AndrewGloria]Really Peni? Bulldoze Zarathustra's lots? I think you will find that they all enjoy rigorous legal protection as Buildings of Outstanding Architectural Merit. Such a clever idea using the plopables w/ the parking lots! A lighting effect might be possible if you felt ambitious and wanted to experiment. My roof lights are lit through the txmt and are visible from hood view. Which makes me wonder if you take something like MLC's window films and gave them an opaque glow if the windows would look lighted from hood view? I don't know. If they do look lighted - and nice - a window film and a texture change bhav might be worthwhile. By default the "glow" would be on but when you entered the lot could be turned off w/ a click to play. No clue if any of that would work but it's a pretty simple experiment if anyone wants to test it out and see if something nice could be done. #24 1st Mar 2019 at 4:39 AM Last edited by gazania : 1st Mar 2019 at 4:55 AM. I just wish you didn't get a pixelated blur with adjoining lots. While I am not as good as fitting buildings as some here, it's a little disconcerting that after I take great pains to do so, I have a detailed building on my lot with the chunkier lots in the background. One advantage Sims 3 has over 2 ... background lots look clearer. And goodness ... I thought my catalog was huge! I know finding a lot can be difficult with my stuff. I can't imagine trying to find a lot among 600 of them. I saw on Tumblr that you're already fiddling with this, and it's a fabulous idea! I don't think I could have done all of the stuff above because it's out of my current skill set, so thank you (again) for taking a look at this. Even if it's a bit flawed if the "lights" don't turn off during the day, I think it'll make for some great night shots and would be really use for storytellers and picture-takers, especially. Yeah, better lot imposters is the holy grail for TS2. It's a nice feature of TS3...unless you're playing on a weaker machine where it takes a bit to render all those fabulously-detailed lots so you end up with gray blobs instead. Especially when the Sim is riding in a car and there's not enough time for weaker graphics to render everything in time. So, you know, trade-offs. I think I'd rather have crappy lot imposters than the gray blocks of doom. I mean, yeah, they render eventually, but sometimes it takes a bit if you're not on a super-de-dooper machine. Yeah, that's why the whole thing isn't in there all the time. If it was, it'd probably take the game forever to read it in order to display the catalog. No, I've got an "everyday" folder with some useful lots in it that I use often that's in most of the time, unless I need a particular kind or style of lot. For that, I have a bunch of folders of lots, all categorized. When I know I'm going to need a particular one, I switch out the "everyday" folder for that one and name it so that the game recognizes it.